Ben Townsend won the Match Angles Matches Final. 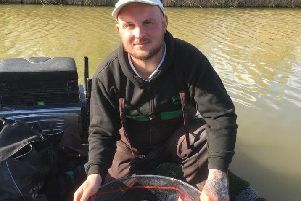 City rod Ben Townsend rounded off a fine run of summer form at the weekend by topping the Match Anglers Matches Final at Heronbrook. After qualifying for the final he made the long trip north pay off handsomely to the tune of £2,000 thanks to some quick thinking. Mel Saggers was a winner on the River Nene. He could not get the normal pole and pellet approach to work so decided to be really positive and feed meat on a short pole line and it worked wonders putting a match winning 201lb to the scales after a great late run of fish. It was a brilliant performance on a water he is not familiar with as he was up against many local stars. One of them, runner up Dave Childs, pushed him all the way with 198lb 12oz, and there were two other 190lb plus weights. JVAC were on their travels again for their annual two day festival event which this year saw them fishing two lakes on the Oaks Fishery in North Yorkshire. The venue has been in prolific form with 175lb plus often not making the top three in open matches. Like many waters around the country though the fishery weights took a dive as high winds, thunder storms and torrenial rain made fishing all but inpossible at times. Day one was fished on the Populars Pool which saw Andy Gausden out in front with a modest 43lb 9oz caught on pellet. Runner up was Ray Pauly on 43lb 10oz, followed by Dave Parsons with 42lb 4oz. Day two saw the lads fishing the Alders Pool and this one saw Dan Abbott topping a strong field. He put 74lb 11oz to the scales. Runner up was Lee Kendal and then came Andy Gausden with 40lb 5oz. The overall two day winner with four points was Andy Gausden taking the event for the second year running, then it was a tie for second place with both Lee Kendal and Dave Parsons on seven points. Mel Saggers took the honours in the Peterborough & DAA George Haines Shield match fished on the River Nene at Stibbington. He caught 7lb 4oz of small fish from peg 2. Runner up was Paul Dotchin on 3lb 10oz, followed by Rob Allan with 2lb 10oz. Top rod in the Saturday open match at Decoy Lakes fished on the Cedar Pool was Danny Carlton who fished pellet and paste on a short pole line for 127lb 2oz. Runner up with 116lb 4oz was John Wilkinson and then came Richard Charlton on 115lb 9oz. The Sunday open saw a bigger field line the banks of the Beastie Pool. Des Proud topped the field with 116lb 3oz from peg 7. He fished a small feeder taking carp to 8lb on pellet and sweetcorn. Jimmy Brooks came in second just behind on 114lb from peg 12 followed by Roy Whincup on 96lb 1oz and Chris Saunders with 95lb 10oz.